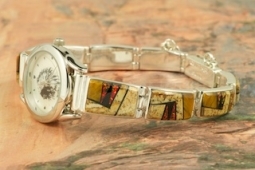 Quartz Watch Bracelet featuring Genuine Picture Jasper and Black Jade with accents of Fire and Ice Lab Opals inlaid in Sterling Silver. 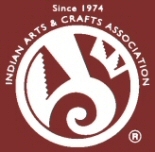 Created by Navajo Artist Calvin Begay. Signed by the artist. Bracelet tapers from 1/2" to 3/8" wide.